This was a lazy day, just hanging out until time to go to Zejtun. On any long trip, it is good to just take some time off to do nothing. 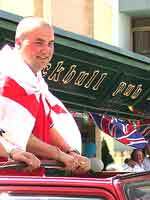 I watched two World Cup games and, as it became apparent that England would defeat Denmark, I headed over to Huggins Pub for the celebration. As noted earlier, Paceville is where the young folks party at night. And it was here that the young Brits celebrated their victory. Shouting, singing, honking horns, hanging out of cars, waving their beer bottles: they celebrated. While the United States snoozes through the six weeks of World Cup matches, the rest of the world eats and breathes football. Ecstasy in victory, soul-searching despair in defeat. For Harry, England, and Saint George! 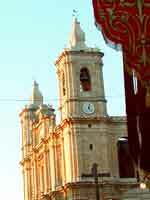 We hired a private taxi and left for Zejtun about 7:30. The driver dropped us off and would meet us again at midnight. 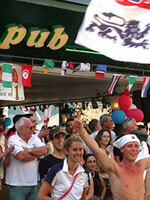 Festa season begins in May and continues all summer. 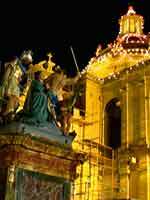 Throughout the Maltese islands, every town and village celebrates its festa day in commemoration of its patron saint. Some towns even appropriate an additional saint and, thus, an extra festa. The religious celebrations center around the statue of the patron saint and the rich decorations that adorn the parish church for the occasion. 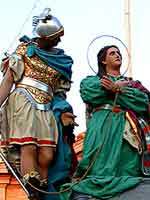 Village squares and streets are also elaborately decorated, providing an enchanting scene during the procession of the patron saint's statue on the final Sunday night of the festa. People from neighboring villages and towns come to join the fun. 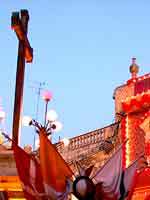 There is no bigger day for a town or village than its festa and the townspeople spend months preparing for it. 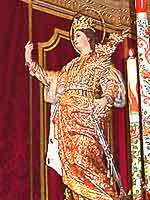 Zejtun's patron saint is Santa Katarina V.M. 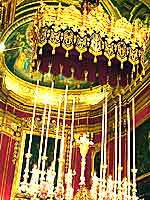 (virgin and martyr) of Alexandria. Although her saint day is in November, it is celebrated in June when the weather is better. 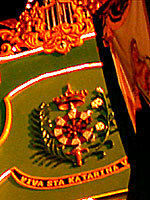 Tonight is Saturday, traditionally the second biggest night of the festa. When we arrive, the Church of Santa Katarina is packed and a service is in process. Outside the church's open doors, a marching band is practicing. The mingling of the religious and secular music doesn't seem to bother anyone inside the church or out. Behind the church are the floats that will be used in tomorrow's procession. Food and drink are sold everywhere. Quite a few booths are selling honey nougat which, I guess, must be a local specialty. Two different bands march about town for a while and then each settles on its own bandstand. During the night they alternate playing, each with its own soloists, an eclectic mix of music: opera, show tunes, Cole Porter, omm-pa-pa. The town dignitaries and spouses sit in designated chairs at the bandstand and when one band finishes, the group moves to their designated chairs at the other bandstand. 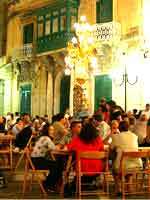 The mass of people sit at tables and on curbs all around the town, eating, drinking and thoroughly enjoying themselves. Later, fireworks light the sky. No child, no matter how young, goes to bed early tonight. We had a wonderful time.